The picture above is terrible. It shows the catastrophic effects of the deforestation caused by the current gold rush in the tropical forests of South America. The consumption of gold worldwide is increasing in the last years due to the global economic crisis and the instability in the financial markets. Approximately 1680 km2 (648.652 square milles) of tropical moist forest was lost in these mining sites between 2001 and 2013. 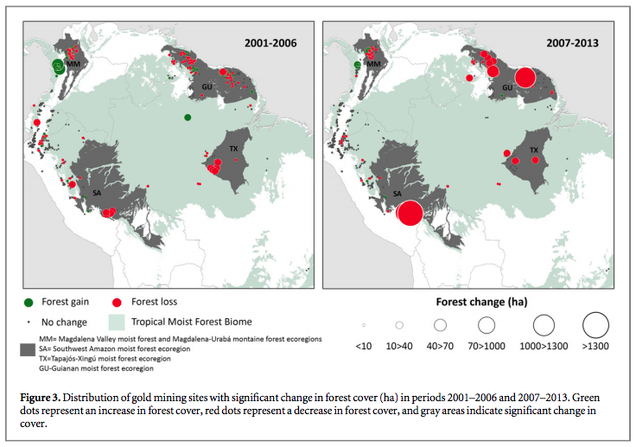 Deforestation was significantly higher during the 2007–2013 period, and this was associated with the increase in global demand for gold after the international financial crisis. Another study by a group of international researchers shows a connection between gold prices, deforestation, and Peru's importation of mercury—used to separate gold from sediments. This satellite image shows the Río Huepetuhue gold mine in Peru.